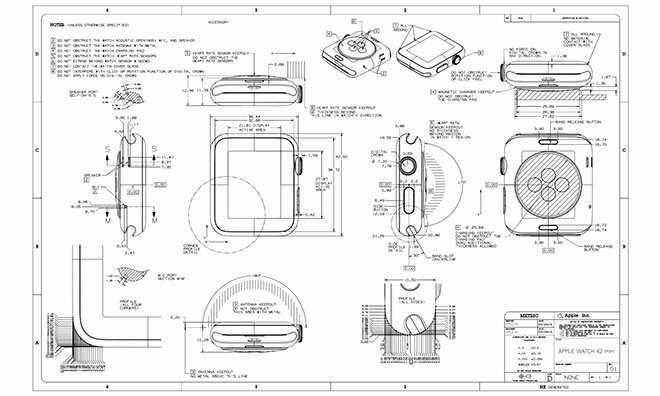 Added to Apple's Developer Resources webpage, "Band Design Guidelines for Apple Watch" (PDF link) offers an extensive overview of the stringent regulations to which third-party accessory makers must abide if they wish to market Watch-compatible straps. The document carries a revision date of April 24, the same day Apple Watch launched worldwide. In the document, Apple notes all band accessories must meet environmental regulations while maintaining a high level of durability as assessed by reliability tests measuring corrosion, metal purity and strength, among others. Special consideration is given to band lugs, integral components that mate straps to Watch by interfacing with Apple's proprietary magnetic attachment system. Design specification regulations are expectedly strict. Apple notes that accessories must allow full Watch functionality, including direct access to the device's heart rate sensor, a clause that prohibits manufacturers from creating bands with magnetic charging capabilities. Cases that block transmission of Apple Pay near-field communications are likewise forbidden. The document includes highly detailed schematics of both 38mm and 42mm Apple Watch chassis, as well as individual specifications for the magnetic band interface and lug design. A separate download contains an Apple Watch lug Drawing Exchange Format (DXF) file for mocking up designs in drafting software like AutoCAD. Apple says official Apple Watch lugs "will be available soon" the new Made for Apple Watch program.